Lunch here is mostly a solo affair as most of my sales staff are out while my office staff pack their own lunched from home. They ALWAYS insists on paying making me feel very free-loader. Also, I don't like people trying to angkat my bola. I ALWAYS over eat their over orders. So here I am at this Cafe De Coral-styled type of restaurant where you order your food and make payment at the counter before they bring your food to your table. The service is fast and my pasta arrived less than 5 minutes after I sat down. I look at the place of food, then I look at the cutlery their gave me. Har? Like that how to eat?? Fortunately, they do have spoons. You just have to walk up to them to ask for it but they will give you the strange puzzled look why you need a spoon for spaghetti. Picture this. Fork & Spoon, Chopsticks & Spoon. Notice something? Both fork and chopsticks are on the same side as they serve as the pick up function to complement the scoop up (or cut up in the case of the knife) function on the other side. So if you have chopsticks and fork, I think it is just plain redundant. You don't see people using spoon and knife, do you? Why? Coz spoon and knife are on the same side and so unless you have two right hands or two left hands, I feel chopsticks and fork combo or in my latter case, knife and spoon combo, is just wrong. You and I know its wrong, but people still learning mah:P To be fair, this thing is more lack of formal training than anything else. Most importantly, how was the food? Ok lah... edible and I am still alive to reply you. haha. Don't like that say me lah. 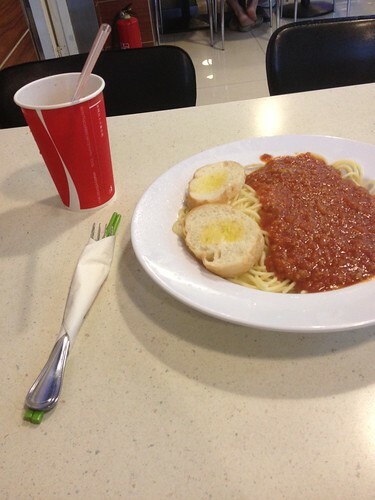 The spaghetti not bad lah.